KCR! Kids Comics Awards | it's yaytime! The KCR! KIDS’ COMICS AWARDS invites kids to pick their favorite graphic novels comic books, webcomics, and more! Kids’ Comics Revolution! hosts Dave Roman and Jerzy Drozd collaborated with editor Chris Duffy (Nickelodeon Magazine, Nursery Rhyme Comics, SpongeBob Comics) and the Ann Arbor District Library on the KCR! Kids Comics Awards to fill the void left by the Nick Magazine Comics Awards, which ran only one year before the popular kids’ magazine ceased publication. Nominees were selected by a council of educators and retailers including Scott Robins. Sharon Iverson, Krystal Tabujara, Jennifer Vincent, Colby Sharp, John Schumacher, Melissa Wiley, Laura Given, Alyson Beecher, and Mary Ann Scheuer. The KCR! Comics Awards offers kids the opportunity to share their enthusiasm for comics of various styles and format. Kids cast a vote for their favorite comics and characters across eight categories both serious and silly. 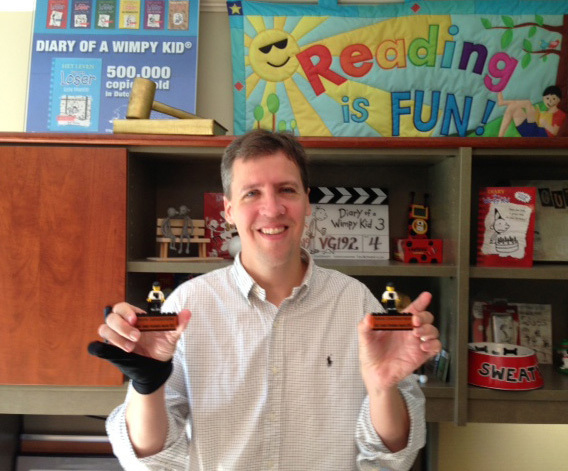 Diary of a Wimpy Kid author Jeff Kinney with his awards for Favorite Cartoonist/Author and Favorite Comic/Novel Hybrid. Awards for 2014 will be announced during a special ceremony at the Kids Read Comics festival at Ann Arbor District Library in Ann Arbor, Michigan. Pingback: Announcing the new Kids Comics Awards! | it's yaytime! I am really, really thrilled that Snarked! was nominated. Only thing, it was published by Boom! Studios, not IDW. I want to make sure people get that right, because Boom were really super-supportive and deserve a lot of credit. But Yay! Fixed it here. Sadly it’s too late to fix the press release and ballots that have gone out. But if you win, we will be sure to make to get it correct on the physical award! Congrats! Hello,I log on to your blog named “KCR! Kids Comics Awards | it’s yaytime!” regularly.Your writing style is witty, keep it up! And you can look our website about مهرجانات 2017. Wow! At last I got a web site from where I be capable of truly take helpful facts concerning my study and knowledge.